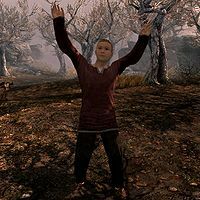 Little Pelagius is Pelagius Septim III as a child. He is seen during the Night Terrors part of the quest The Mind of Madness, when you use the Wabbajack on a bandit. He wears red colored child's clothes and a pair of shoes. This page was last modified on 20 March 2013, at 04:59.